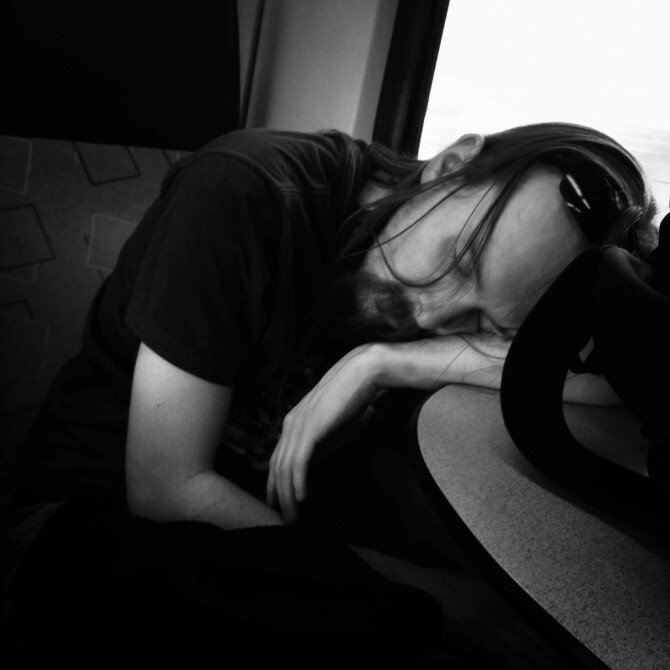 I met this guy and his rockband in the intercity between Amsterdam and Utrecht. I was impressed by the way the band took all there instruments and stuff by train: they were lugging themselves many large black boxes. The band – I don’t know the name – was on European tour. The traces of an intensive existence were palpable and smelly in the coupé that was almost entirely filled with the band. At half past five in the afternoon, I suddenly was no more than a spectator in a-apart from the roady-riven in deep sleep, almost all of them black-clad rockers. A woman and four men. I could not resist to take a picture with my iPhone and my favourite Instant 110 app and try to express a small bit of this all.